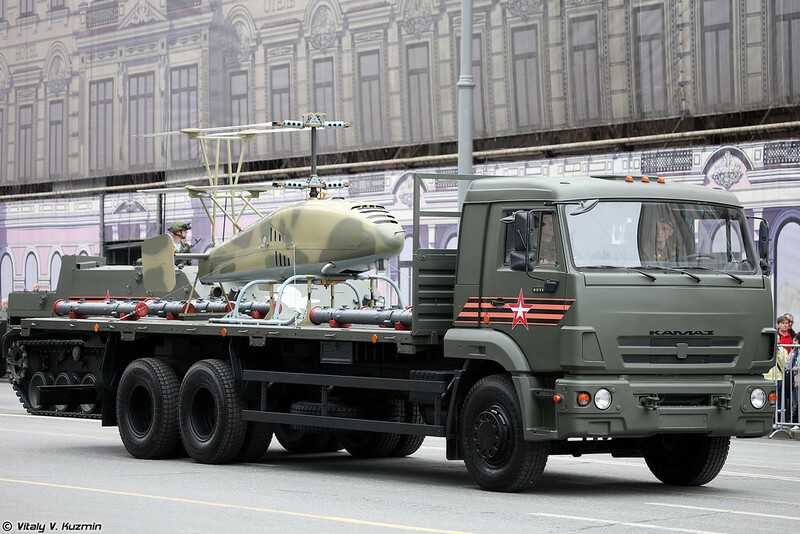 On May 9, 2018, "Katran" — a rotary-wing unmanned aerial vehicle (UAV) prototypes were first unveiled during 73rd Victory Day Parade, transported by KamAZ-65117 multipurpose trucks which also act as an autonomous ground station. Katran, the name is a derivative of a "spiny dogfish", one of the best-known species of the Squalidae (dogfish) family of sharks. However, the same name has been assigned to a naval version of the Ka-52 Alligator reconnaissance and combat helicopter. On the truck's flatbed trailer, the UAV was seen with a number of 9M113M Konkurs-M (NATO: AT-5B 'Spandrel-B') and 9M120 Ataka (NATO: AT-9 'Spiral-2') anti-tank guided missiles (ATGMs). However, the UAV itself didn't carry any stub-wing pylons to accommodate these missile systems. Since these UAVs are the prototypes, the appearance will change and get optimized after the completion of initial trials, starting from mid-2018. Commenting on the parade, the announcer reported that the Katran UAV is designed "to provide tactical support to special forces operations and, in turn, enhancing the Battlefield Situational Awareness (BSA) through aerial reconnaissance by using various optical or thermal imaging equipment." 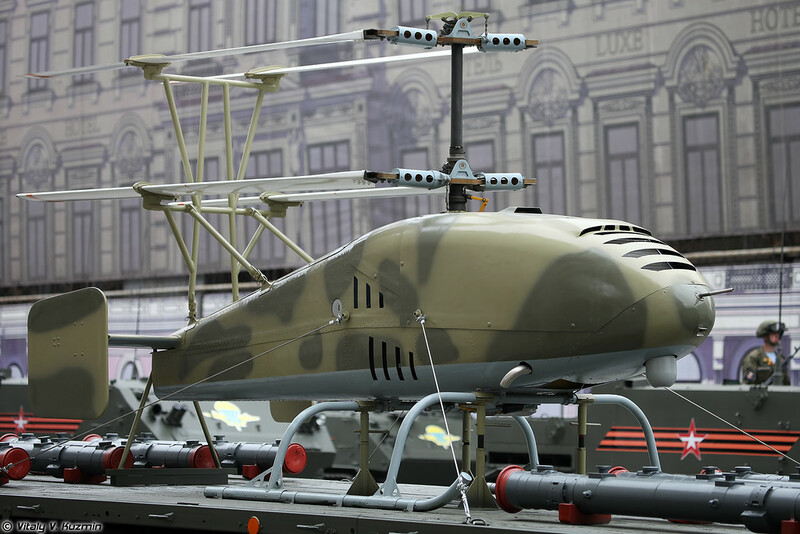 Katran UAV is based on the unique co-axial inverted rotary design which was patented (Registration number of the application: 99108371) in the year 1999 by the engineers working at OAO Kumertau Aviation Production Enterprise (KumAPP), a Russian aerospace defense contractor which primarily manufactures "coaxial helicopters" for country's naval forces. The general "coaxial rotary propulsion design" eliminates the need for a tail rotor and solves the problem of main rotor torque by turning each set of rotors in opposite directions. The opposite torques from the rotors cancel each other out. The rotational maneuvering i.e., yaw control, is accomplished by increasing the collective pitch of one rotor and decreasing the collective pitch on the other. This causes a controlled dissymmetry of torque. According to the managing director of the plant, Yuri Pustovgarov, "the Katran is completely made by our engineers, only the gearbox elements were ordered from JSC 'UDK-UMPO' ". He further added, "The design process took over two years. Overall, the UAV weighs 350 kg (with varieties of mission packages), and if necessary, it can lift a load almost to half of its weight, can cruise at a top speed of 150 km/h and with 4 hours endurance". 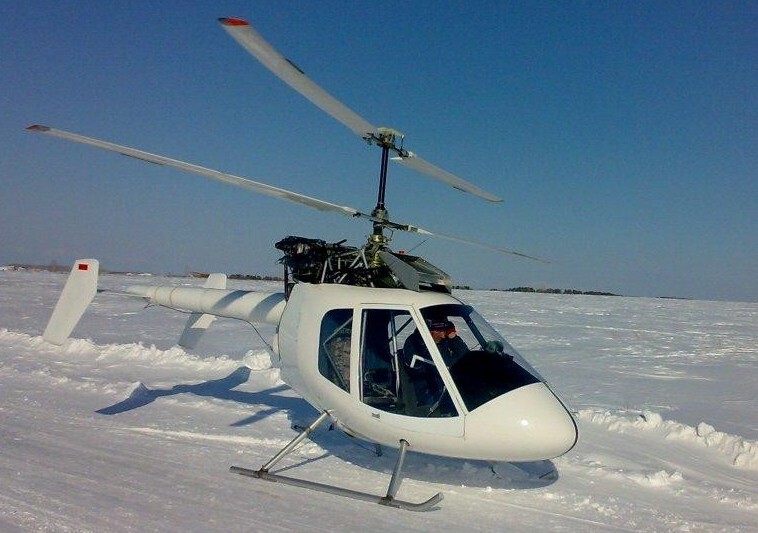 On January 3, 2018, according to a local TV report (aired by State Unitary Enterprise Television and Radio Broadcasting Company Bashkortostan), the first Russian unmanned helicopter was being built at Kumertau helicopter factory in the Republic of Bashkortostan. It was reported that the work on the project is being carried out by the holding company "Russian Helicopters" - the design and technology center of KumAPP, Saratov Industrial Automation Design Bureau (KBPA, part of the JSC 'KRET' - The concern Radio-Electronic Technologies), and the Union of Russian Aviation Manufacturers (GosNIPP), an Almaz-Antey entity. On January 31, 2018, State Corporation Russian Technologies (Rostech) released a press statement about the beginning of tests of an unmanned helicopter with a take-off weight of up to 500 kg. During the same period, a local TV station confirmed the same news. On May 9, 2018, two prototypes of Katran UAV were unveiled at 73rd Victory Day Parade in Moscow. On May 11, 2018, an article in a local news website revealed the details of UAV. 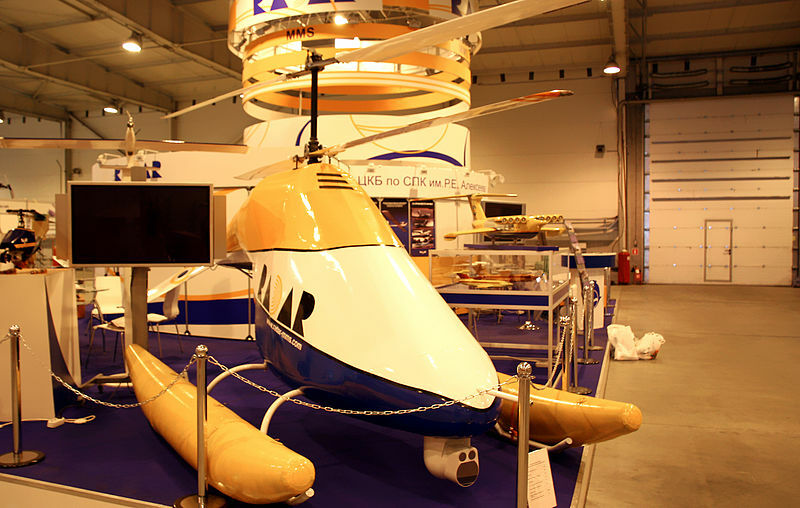 The article was heavily cited with words and diagrams from a GosNIIP's technical report on the prototype manufacturing of a multifunctional helicopter system. 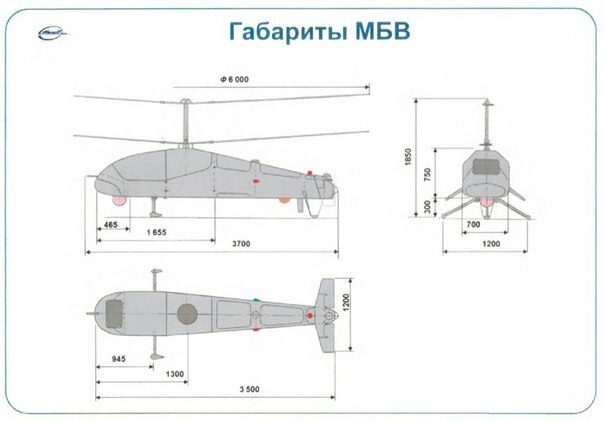 The report includes the engineering drawings of 4 small unmanned helicopters and the appearance of the Katran UAV at the parade is similar to one of the schematics as shown below. The take-off power of the engine - 115 hp. 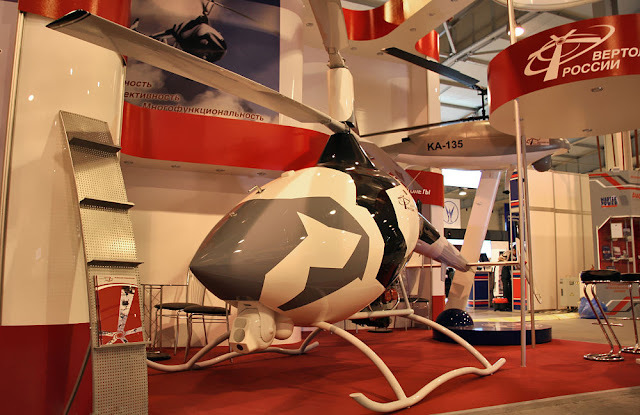 The Kumertau Rotorfly was originally designed by Victor Hribkov and was first publicly introduced at MAKS 2005. The development process took place in the first half of the 2000s, and the goal was to produce an ultralight, kit-built helicopter. Unfortunately, selling the helicopter proved to be difficult because it had to be built by the buyer. It was for this reason that a deal was made with Kamov (2008), which now builds the Rotorfly on a custom order basis only and delivers it as ready-to-fly. 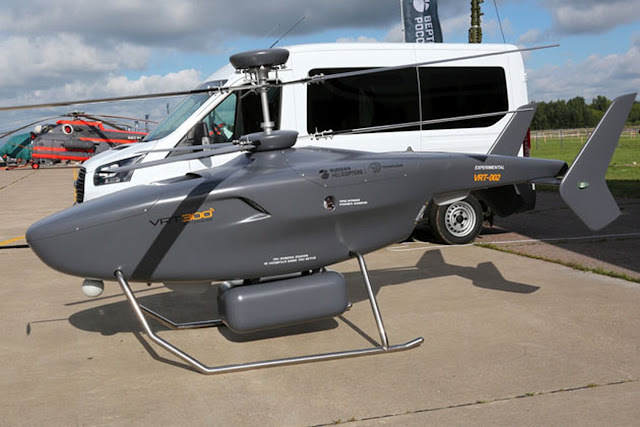 Based on the Rotorfly, earlier in 2010, "Korshun" — medium-range unmanned co-axial rotary-wing UAV - weighing 500 kg, with a range of 300 km, with a maximum payload of 150 kg and at a maximum speed of 170 km/h was unveiled at 4th International Forum and Exhibition Unmanned Multipurpose Vehicle Systems - UVS-TECH 2010, held as part of Engineering Technologies 2010 (Zhukovsky). 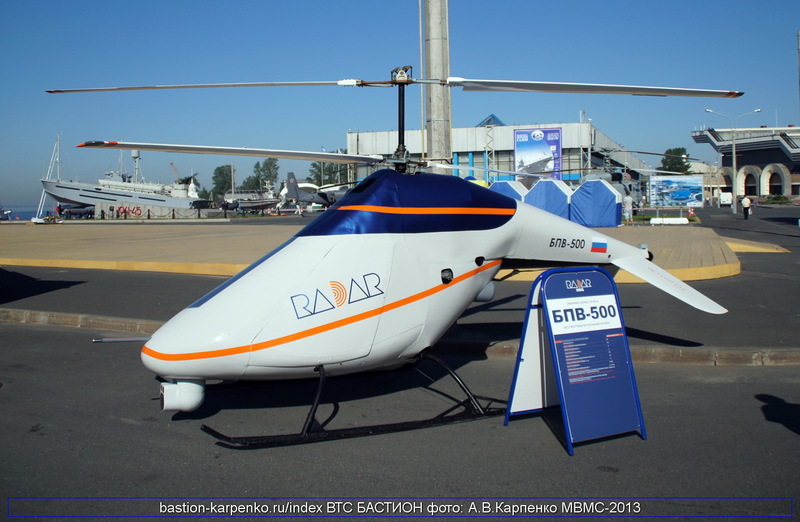 During the same exhibition, 4th International Forum and Exhibition Unmanned Multipurpose Vehicle Systems - UVS-TECH 2010, Russia’s Radar MMS research and production company unveiled BPV-500 with "utility floats". In 2013, the second iteration with "landing skids" was unveiled at MVMS 2013 - The International Navy Exhibition at St. Petersburg. Despite having the assured investment for these two unmanned rotary-wing prototypes, somehow, both the projects collapsed. 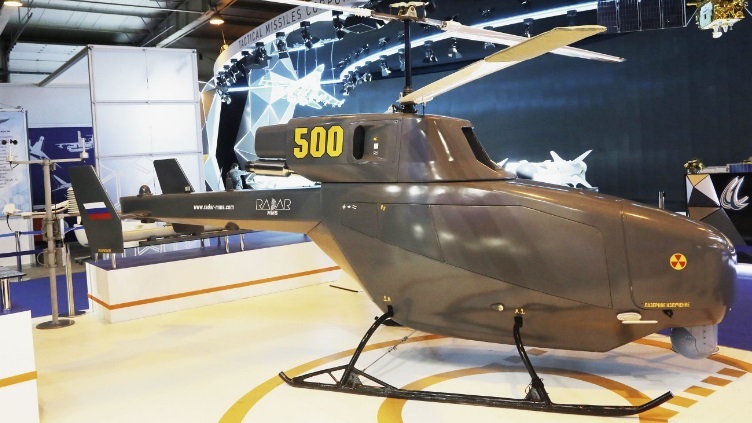 However, in July 2017, Radar MMS silently unveiled it’s modernized version of BPV-500 unmanned helicopter - first at the International Maritime Defense Show in St. Petersburg and later at MAKS 2017. The new aircraft has a maximum take-off weight of 500 kg and a payload capacity of 150 kg. According to Radar MMS, it has an endurance of 5.5 hours, a ceiling of 11,482 ft, a maximum speed of 155 km/h, and a range of 320 km. The aircraft can operate with varying levels of autonomy, including pre-programmed missions. On April 20, 2018, two weeks prior to the Victory Day parade (where Katran was unveiled) — VR-Technologies Design Bureau, a part of Russian Helicopters consortium — began the bench testing of its coaxial rotary wing UAV named as VRT300, which has been developed purely for civilian applications. VRT300 is available in two configurations — the first, named the Arctic Supervision, boasts a side-view radar for reconnaissance and operation in icy conditions, while the second, which has an increased flight range allowing it to be commissioned for monitoring and remote sensing operations, is named the Opticvision. Both models are powered by an undisclosed heavy-fuel engine and have a payload of 70kg. Flight testing of this 300 Kg UAV is scheduled to begin by the end of 2018. Analyzing the various published materials, it can be assumed that the Katran project is most likely based on technologies and design solutions tested on the piloted helicopter like Rotorfly, which Kumertau OKB Rotor has been developing with KumAPP since many years. 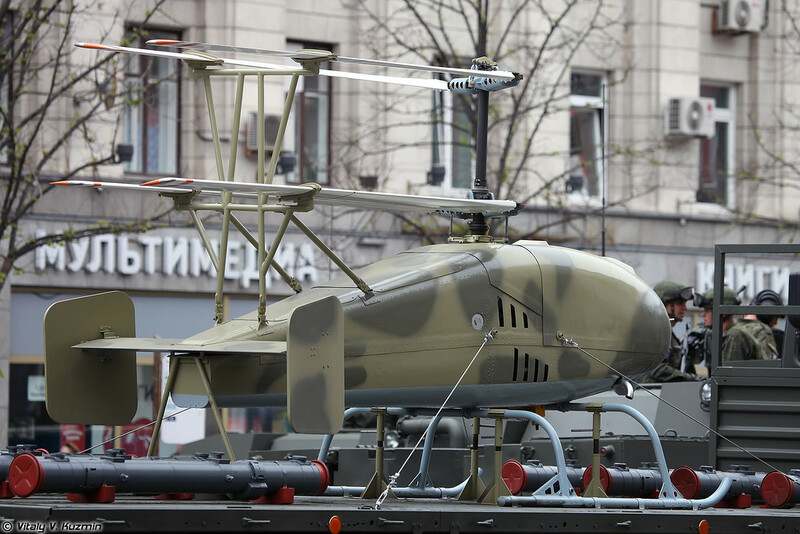 The participation of two Katran UAVs in the Victory Day parade indicates that the idea of manufacturing and deploying a coaxial rotary-wing UAVs in Russia is taking the center-stage. Russians are starting to move away from ‘regular’ UAV designs and constantly experimenting with a variety of drone designs and their applications. The operational designs are now converting into full-fledged prototypes at a faster rate and the initial production models (originating from the prototyping phase) are finding its way to frontline Russian forces in the shortest period of time. It is clearly foreseeable, Russia as a country is going to give tough competition to existing global drone leaders — the United States and Israel.